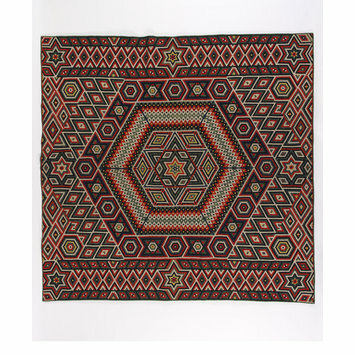 Military or soldiers' quilts are made from wool serge or worsted twill, used in the production of military uniforms. 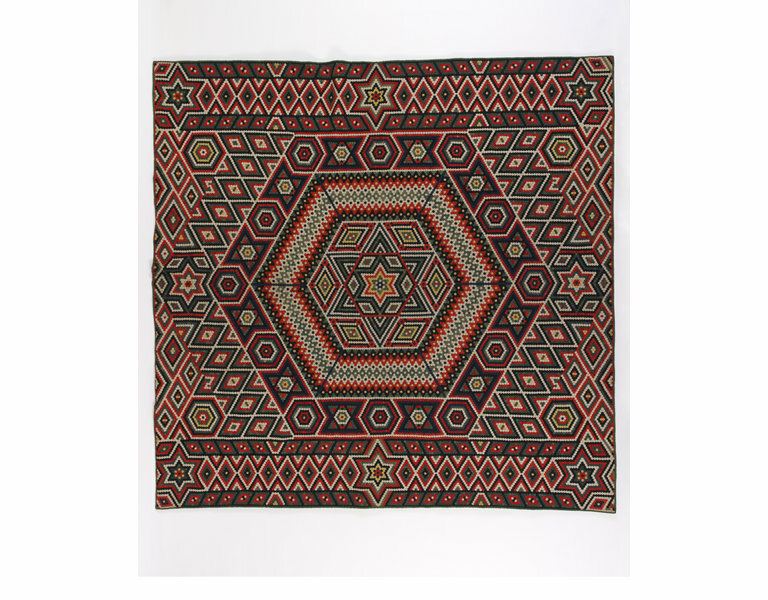 Because of the thickness of the cloth, piercing and sewing the quilts was extremely difficult and it is unlikely that any military quilts were made by women. The mid-nineteenth century was a period when the fashion for colourful and elaborate patchwork was most prolific in Britain and military quilts represent a unique chapter in the history of the craft. Military quilts are often referred to as 'Crimean Quilts' (Crimean War 1853-56). Brightness of colour is a key feature of quilts made in India, unlike the more subdued colour palette of Crimean quilts. Erroneously attributed to one William Brayley, research revealed that the quilt was actually made by his father, Francis Brayley, a Private in the 1st, 11th Foot Regiment, who served in India between 1864 and 1877. Within a month of returning to England, Brayley married Mary Ann Ash, with whom he had one son, William. Brayley died three years later from tuberculosis. Patchwork quilt made from pieced wool. Complex geometric pattern created from small hexagons featuring six point stars, large diamonds and hexagons in black, white, red, green and yellow. Each individual hexagon measures 1.5 cm in diameter. Backed with green damask. The quilt was acquired at auction. The quilt had been in the family of William Brayley until its acquisition by a dealer and subsequent sale at auction. Erroneously attributed to William, the quilt is believed to have been made by his father, Franics. 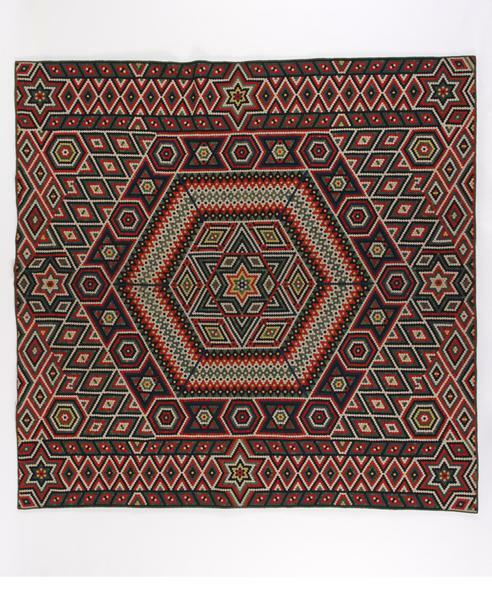 More than thirty examples of military quilts were exhibited at the Great Exhibition in 1851. 'The British Workman' published an article in 1875 on a soldier who took up patchwork when he gave up drink, saying 'I must be employed, or I shall get into mischief'. He made three patchwork quilts, one with 28,000 pieces, which he sold to his commanding officer for £10. This 'military quilt' of tailor's broadcloth may have been created or purchased by Francis Brayley, a private stationed in India between 1864 and 1877. Soldiers were encouraged to take up sewing as an alternative to the less salubrious pursuits of drinking and gambling. In the late 1860s, Soldiers' Industrial Exhibitions offered prizes for skills as diverse as rifle-shooting and embroidery. Needlework was also used as a form of therapy for those injured in conflict. In this rare propaganda portrait - designed to allay public concerns over hospital conditions for soldiers - a private is shown piecing together a coverlet from military fabrics. Private Thomas Walker was wounded in the head at the Battle of Inkerman in 1854 during the Crimean War. He was seen by Queen Victoria when she visited the Fort Pitt Military Hospital in 1855. Erroneously attributed to William Brayley at the time of acquisition, research has revealed that the quilt was more likely made in India by William's father, Francis Brayley, a private in the 1st 11th Foot Regiment who served in India between 1864-1877.